Duration: 19 min. per ep. In 2010 a film based on Kaidan Restaurant was directed by Ochiai Masayuki. The film is a mix of live-action and animation. Story is about 3 middle schoolers telling or experiencing some classic japanese horror stories. Each episode is split in 3 parts, something that happens to them, something they tell and 1-2 minute short. When you see horror tag in anime, it usually means a lot of blood or human torture. Your classic horror movies often rely on on jump scares - woman walks down the dark halway of her house with only flashlight, nothing but her footsteps are heard, suddenly killer appears behind her with loud "bang" ambience and you get scared just for that moment. I'm glad these stories are different - they build up tension just to leave you creeped out at the end. Few problems I had - to me they often felt unfinished, like they tried to squeeze as much as possible into their allocated time. Also, I was surprised how often were authors bringing up the concept of death, since this is basically kids series. And because this is kids show, none of the characters died despite being really close to it, thanks to some randomness that occured. Don't get me wrong, I didn't want to see them die, but it was killing the tension - whenever someone was about to die, you just knew he'll be fine. Probably the weakest point. Animation was pretty weak, backgrounds and character design simplistic, those ghosts/monsters more often than not, uninteresting. Ending was ok, no opening. Surprising right? How dares a japanese show to not have an opening theme! Actually it had something similar - shows you as guest going to thriller restaurant, where ghosts and monsters present you menu with some "creepy" foods, while playing "classy mansion" ambience in the background. Was supposed to serve slight comedic purpose - didn't work on me, as those food names sounded incredibly cheesy. Left me with "what the hell are you trying to do with this" feeling every time. Character development is close to 0. This isn't surprising as each episode is a standalone set of stories. As main you have this trio of kids - scaredy cat, who likes stories, tsundere girl who doesn't believe in ghosts but always tags along because "it can't be helped" and a blondie boy, who usually saves the day. There are few more of their classmates, but they don't always play a role in episode. Yeah he's that kind of guy. And his saves seemed way too random and pulled out of nowhere. Despite the bad stuff I mentioned, show is surprisingly enjoyable. Each story is unique and will leave you little bit creeped out. Therefore was fun to watch (except for occasional annoyance from few characters). Do you like horror stories? How about classic japanese horror stories? Then please don't get put off by "kids" tag, as it shouldn't stop you from enjoying this little piece of work. Although, I can't help but think how much better this could be, would they drop the kiddy aspect and made it more like Yami Shibai but animated, or Aoi Bungaku Series but episodic. Kaidan Restaurant is apparently based on a series of children's books; naturally one would expect its story to be simplistic and its characters to be one-dimensional. Neither is entirely untrue, however surprisingly these apparent shortcomings do not detract from the enjoyment this show provides. The series lacks a definitive overarching plot and rather consists of an anthology of horror stories centered around a group of school children and the town they live in. The stories are presented by the manager of the Kaidan restaurant to the viewers. They may be experienced or narrated by the protagonists. Though almost none of these stories are genuinely frightening, they do have their slightly unnerving moments; some even border on the emotional rather than the supernatural.Also the inclusion of several folktales and traditional ghost stories not only from Japan but from around the globe, makes for a delectable recipe. Not having seen the live-action movie that followed the anime, I do not know if the story continues or not; but I would like to know more about the Ghastly Garcon and his connection to Ako, which was hinted at in the last episode. Overall a delightful series which may be far from perfect, but serves its purpose decently and provides a welcome relief from continuously watching serious plot-heavy stories in anime. P.S. I absolutely loved the ending theme song, LOST BOY. Kids anime? Based on my opinion as a 15 year old im against the fact that this is kids anime. At a first glance it doesnt seem all that scary,but i was mistaken.When i watched the first episode, it pretty much creeped me out so i watched the next and then the next and the next and the next. Each episode is split into 3 sections.The two stories will be about ako and weird phenomenons that happen to her and her friends.The 3rd part will be aghost story told by ako and her friends. Some may just be a little weird and creepy but to be honest some actually frightened me a little. Some of the stories are interesting and i certainly enjoyed most of them. Although the art maybe not be up to expectations it would be considered average but it cant be compared to all the really detailed new animes. The back ground music really fits the situation and might give u a fright at certain parts. The first episodes haven't impressed me much - they were nor annoying, nor special. But for some reason I continued watching and unexpectedly began to enjoy it. 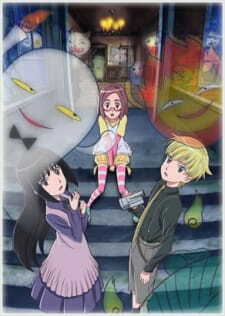 I can't say I've ever liked ghost stories and stuff and, fortunately, it didn't matter - 'cause the stories told in this anime aren't scary at all. In fact, it's not the storytelling which makes you watch this show. As for me, I was delighted by the number of various myths and legends collected in these episodes: I've even recognised 2 russian fairytales, which are very familiar to me 'cause I'm from Ukraine :) So it's one more way to learn about japanese culture and people's customs. Summarizing, it's not an anime which makes millions of people scream "What will happen next?". Though, I believe many people will find it enjoyable to learn something new about Japan and will relax for at least 20 minutes watching calm fairy-tales. Looking forward to downloading the new ep! Top 25 Best Kids Anime For "Kids" of All Ages! Let's take a quick jog around memory lane and remember those anime you used to watch and enjoy as kids. Feel the nostalgia and see if your favorites made the list and discover more that other children enjoyed. As if you haven't been spooked enough yet, here's 5 terrifying and creepy anime but were either based off children's stories, or were intended to be watched by children.